Mac OS X Lion, slated for a Wednesday release, may embrace multitouch gestures and trackpad shenanigans, but if you prefer a keyboard-based solution for your mousing and navigation, software company Many Tricks may have just the ticket for you. The company has released Keymo, a new tool that allows users to move and orient their on-screen cursor by way of keyboard shortcuts. With Keymo, you can use a variety of global hotkeys to control your pointer—all without ever needing to touch your trackpad or mouse. You can associate shortcuts with a variety of commands: Move; Move by Division; Move to Edge/Corner; Move to Other Display; Center; Scroll; Click and Right-Click; and Toggle Permanent Mouse Highlight. Every one of these commands can be customized from the Keymo defaults. The Move command works by moving your cursor up, down, or side to side by a preset number of pixels after you execute your keyboard shortcut, for precision. If you’d rather the shortcut work more like a mouse, you can set the movement to accelerate if you continue holding the keys; users can also enable cursor restriction to the current display. 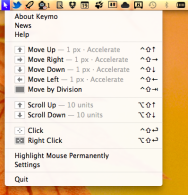 If you enable Keymo as a menu applet, you'll be able to quickly reference all your commands. Move by Division, meanwhile, divides your screen up into sections, and each press of your key command will hop your cursor over from space to space; Move to Edge/Corner, Move to Other Display, and Center are self-explanatory, bouncing your pointer to your screen’s corner, your external display(s), or the center of the screen; Scroll will allow you to go up or down by a certain number of pixels; enable Click and Right-Click, and you can execute clicks using a key command, along with any specific modifier keys you’d like to include with the click. And in case you’ve misplaced your cursor, Toggle Permanent Mouse Highlight will highlight your pointer for easy visibility, using one of three designs—a spotlight, giant transparent mouse, or “Right here” speech bubble. You can run the app as a stand-alone application, as a menubar applet, or entirely in the background; run it as an applet, and you’ll be able to easily access your full list of shortcuts for reference. Keymo is available for $5 from the Mac App Store (for Macs running OS X 10.6.6 or later) or from Many Tricks directly (for Macs running OS X 10.6 or later). Disclaimer: Rob Griffiths, a former staffer who contributes to Macworld from time to time, is a partner at Many Tricks.